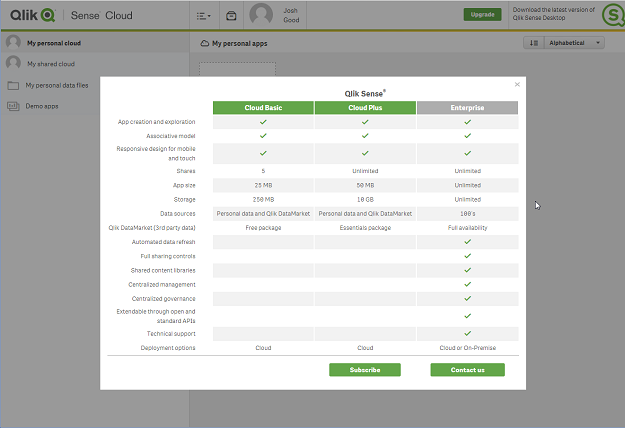 Qlik Sense Cloud users now have access to unlimited app sharing! Back in April of 2015 I wrote about the launch of Qlik Sense Cloud and since then the response and adoption has been tremendous. We now have tens of thousands of users creating and sharing Qlik Sense apps on all continents (except Antarctica as far as I know) but one of the most frequent requests I hear is that users would like to share with more than five people. So I’m delighted to announce that Qlik Sense Cloud Plus is now live and this enables users to share with an unlimited number of other users. In addition, the Qlik DataMarketEssentials package, which includes third party currency, weather, social and economic data, is also included to further enhance your analysis. If you are unsure why you should use third party data or how to get started using it then take a look at these two blog posts by Josh Good. We know these enhancements will result in larger apps and more apps in total: so Qlik Sense Cloud Plus also doubles the maximum app size to 50 MB and increases total storage by 40 times to 10 GB (enough capacity to create many apps in excess of a million records). This is all available for a nominal monthly subscription of $20/month. Note: This price is listed in US Dollars and will vary by region and currency. Log into to Qlik Sense Cloud and click ‘Upgrade’ to see pricing in your region. So what does unlimited sharing really mean? This means that only one user will need to subscribe to Qlik Sense Cloud Plus to share with as many other users as desired. The other users can register for the free version of Qlik Sense Cloud, which will now be known as Qlik Sense Cloud Basic and still fully interact with shared apps. Introducing unlimited app sharing with #QlikSense #Cloud Plus! For example, an analyst on a sales team can subscribe to Qlik Sense Cloud Plus and share a sales performance app with the entire sales team of 10s (or even 100s) of sales reps. This will require only one Qlik Sense Cloud Plus subscription at $20/month with the rest of the sales team signed up for Qlik Sense Cloud Basic. I really think this is a great deal for any group to get started with visual analytics. As your needs grow, your organization may also find benefit in the additional centralized governance and manageability provided by Qlik Sense Enterprise. This will add capabilities such as automated data refreshes, create security rules and create centralized content libraries. Want to learn more? 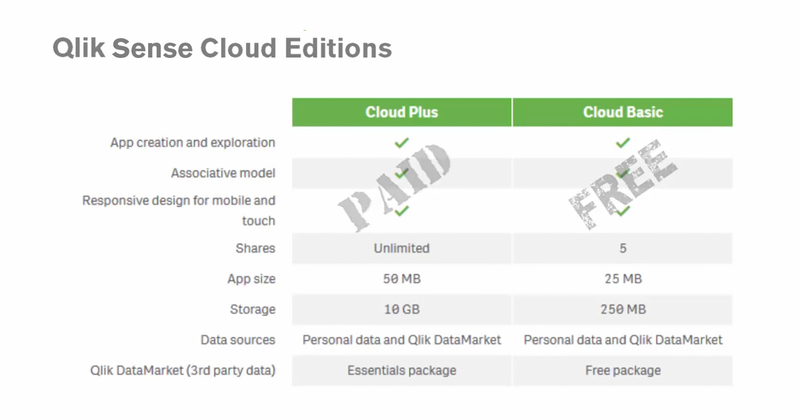 Below is a comparison of the different Qlik Sense editions that can be accessed in Qlik Sense Cloud. As before, users can create and share fully interactive apps with Qlik Sense Cloud – no desktop downloads required. Qlik’s associative model enables you to see the whole story that lives within your data but now there is no limit on who else can also interact with the app (provided they are invited to interact). All apps work on any device, including mobile devices, thanks to the responsive design native to Qlik Sense’s smart visualizations. Subscribing to Qlik Sense Cloud Plus can be accomplished through our new e-commerce capability. Users can subscribe and checkout all while online using a credit card. Just click “Upgrade” in the top right corner of the Qlik Sense Cloud hub and then “Subscribe” under Qlik Sense Cloud Plus. The launch of Qlik Sense Cloud Plus with added integration to our e-commerce capability is just the tip of the iceberg in terms of what we have in store for the cloud this year. What else is on the horizon? You’ll just have to stay tuned….